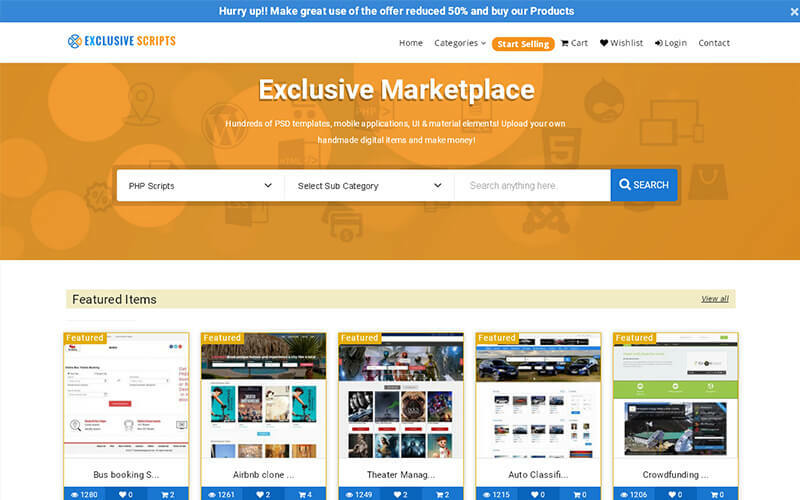 If you would like to start your own template marketplace website then choosing our PHP template store script is the best choice you can make. Our Templatemonster Script has more features and it contains various categories like wordpress plug-in, CSS, graphic, flash and more. If you develop our Templatemonster Clone Script from scratch you need to spend minimum time of hundred hours to create the abstract, design and coding. We are here to reduce your research time and you can check our Themeforest Clone Script user demo instantly. Nowadays most of the people looking for readymade solution and also the designers need some efficient store or market place to sell their templates instantly. In this corporate world lot of companies are looking forward to launch their own website. In this fast developing era people don’t have much time to spend in creating their own website right from the scratch and in this case they look forward to buy these readymade website designs and you can generate more revenue. If you are a website designer and can create readymade templates or if you are a freelance designer who wants to launch your own template store website and upload different templates then you can go for our Readymade Online Website Template Store Script. Through admin, you can create main categories, sub-categories and add categories based on the availabilities of your templates. You can upload your template description, images, costing of each template. In our Codecanyon clone script, you can find WYSIWYG editor for HTML formatted for the item description. Through this editor, you can format your description of the templates and summary of the product which you post without much technical knowledge. Through admin dashboard, you can understand all the member list, payment list, overall history of sales etc. You can find an excellent dashboard in a single window for active and inactive client deals, overall sales for different time zone. Apart from this, we provide you with 1 year of technical support and 6 months of source code updates. Upon purchase of the Themeforest Script, we will give you the full source code and the product is absolutely brand-free. If you still have queries, feel free to contact us. We would be glad to help you out. It is an amazing script. Being a web designer I was able to create my own designs using this script. After purchasing this I was profited very much. The developers supported me well to use this script. Thank you so much guys. This is the script which i was needed! Thank you so much for your script!! It is an easy go script. My online business was going good and it fetched me good amount. The technical were kind answering my questions. So friends you can also go with this software and start doing your online business. You can also have a good fun and good revenue. I had some problems in this script I could not able to find what problems occur. So I contact their technical support team they helped me with every single issue and customization.